That is one question that we all answer, every day…although sometimes unconsciously. 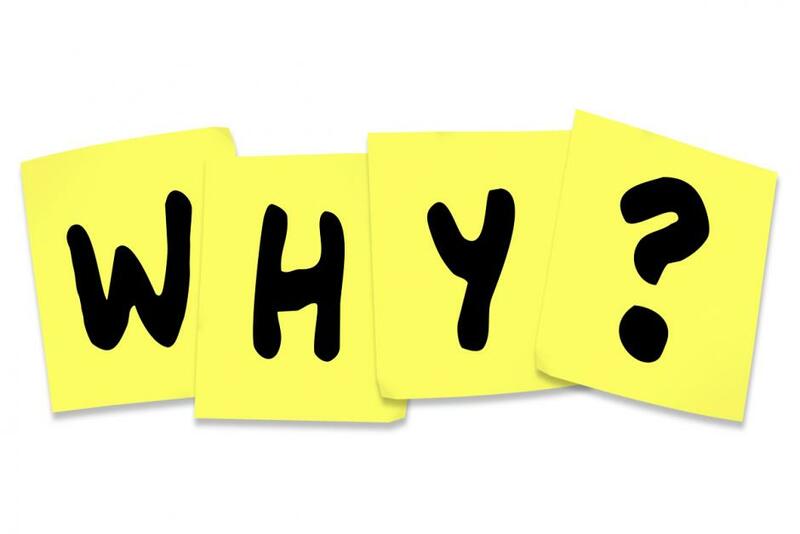 Simon Sinek wrote an excellent book about this, Start With Why, and the premise is simple: If you’re going to lead people well, (including yourself) you need to…’start with Why’? Why should I do what you say? Why should we follow this course? Why should I get up early to exercise…go to work or school? Why should I pay my bills? Why should I eat right? If we don’t answer that question, then we are much more likely to live halfhearted, unfocused lives. We are more likely to move from one job to another, one major to another, one relationship to another, one diet to another, one credit card to another, and so on. In addition, the ‘quality’ or our answer will determine the joy and satisfaction we get out of life. Take a job, for example. If the answer to my question of ‘Why should I go to work?’ is simply ‘To get a paycheck’, that’s a great recipe for a bad job, in which I get no satisfaction, end up doing the bare minimum that I need to in order to keep my job, complain the whole time, etc. In contrast, if I can honestly say something like, ‘Because my job matters. I am called and gifted for this job. This job is an important training ground for my next job, and the things I learn here will help me in the future…’, then I am much more likely to give my all to it. So…let’s apply that to faith. Why should I pray, read the Scriptures, and worship? Why should I give your money to the work of God? Why should I conduct your relationships according to His Word? Again, if the only reason is, ‘Because I’ll get in trouble if I don’t’, or ‘Because it’s good for me’, then I’ll completely miss out on the blessing of knowing God and the pleasure and security of knowing that your life is secure in His hands, and His ways are best. In fact, you will find in many places in the Word of God: God knows what is best, God loves you and wants the best for you, and the best way to the best life is by following Him and His Word, period. Our society tells us lies. It tells us that ‘Looking out for #1’ is best, or that ‘Using others for my pleasure’ is best. It will tell you that ‘Living for today’ is best. “The thief comes only to steal, kill and destroy; I have come that they might have LIFE and have it To The Full!” (John 10:10, emphasis added). This especially shows up when God’s Word says one thing, and my friends (or culture/my appetites/my family) says something else. What will determine which I choose? That depends: What is your ‘Why’? My ‘Why’ is this: I know that I exist by His design, for His glory, and that I live in His grace. Therefore, my desire is to know and please Him, in all things. That gives me meaning, direction, and joy–no matter the circumstances. It guides me along. It teaches me what to say ‘yes’ to, and what to say ‘no’ to. It is both for His glory and for My good…at the same time! What is Your ‘Motivation for Living’?